In 1815, Kamehameha I granted Russian representatives permission to build a storehouse near Honolulu Harbor. But, instead, directed by the German adventurer Georg Schaffer (1779-1836,) they began building a fort and raised the Russian flag. When Kamehameha discovered the Russians were building a fort (rather than storehouses) and had raised the Russian flag, he sent several chiefs (including Kalanimōku and John Young (his advisor,)) to remove the Russians from Oʻahu by force, if necessary. The Russian personnel judiciously chose to sail for Kaua‘i instead of risking bloodshed. On Kaua‘i, there they were given land by Kaua‘i’s King Kaumuali‘i; the Russian Fort Elizabeth was built soon after on Kaua‘i. By 1830, the fort had 40 guns mounted on the parapets all of various calibers (6, 8, 12 and probably a few 32 pounders.) Fort Kekuanohu literally means ‘the back of the scorpion fish,’ as in ‘thorny back,’ because of the rising guns on the walls. In 1838 there were 52 guns reported. Fort Street gradually became the retail and business center of the Island throughout the 1800s and into the 1950s; it hosted several of the largest department stores in Hawaii including Kress, Liberty House and Woolworth’s. Other stores were located along its streets. However, by the 1940s, some foresaw the decline of downtown. Traffic congestion, inadequate parking and competition from suburban shopping centers drained business from downtown. In 1949, the Hawaiʻi Chapter of the American Institute of Architects made the first proposal to close Fort Street to vehicular traffic. Nothing happened; then, with the announcement of the planned Ala Moana Shopping Center, many feared a mass exodus from downtown. In response, the Downtown Improvement Association was formed in 1958. It developed a master plan for downtown. Little happened, for another 6-years. Then, a pilot project closed Fort Street, in conjunction with the Golden Harvest Celebration. While downtown business declined with the opening of Ala Moana Center, more studies and plans were prepared, until, finally, the City Planning Commission hired Gruen to develop a plan. The plan called for downtown super blocks, with a system of pedestrian malls. In January 1968, the City Council approved Gruen mall plan, after 75% of adjoining owners indicated their consent. Fort Street Mall is 5-blocks in length (1,738-feet,) extending from Queen Street up to Beretania Street. Construction began in June 1968 and was completed in February 1969, at a cost of $27-millon. Its average width is 50-feet, at the King Street Plaza it widens to 83-feet and at Father Damien Plaza on Beretania Street it becomes 93-feet. There are cross streets at Merchant, King and Hotel with a pedestrian underpass (and Satellite City Hall) on King Street. Today, the Fort Street Mall Business Improvement District Association, a nonprofit corporation consisting of property owners and ground lessees adjacent to the Mall, manages the Mall by supplementing the services (primarily maintenance and security) currently provided by the City and County of Honolulu. Like most urban settings, Fort Street Mall’s character changes block by block. As you walk along the Mall, the businesses and the patrons indicate changes in the Mall’s identity. Across from the Cathedral of Our Lady of Peace at the mauka end of the Mall, the Hawaii Pacific University presence gives the Mall a college feel. Students periodically fill the Mall when classes let out and they stroll to one of the many buildings that HPU occupies on the Mall. 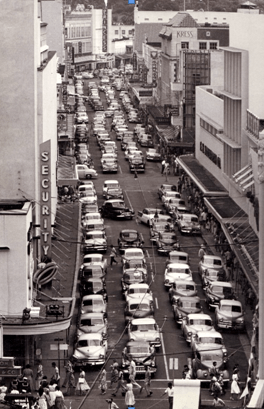 The image shows the Fort Street traffic, prior to conversion to a Mall. In addition, I have added other related images in a folder of like name in the Photos section on my Facebook and Google+ pages.